The Compact Yard is a scaled down version of the Standard Yard with a holding capacity of about 100 sheep. Extra gates and components can be added as sheep numbers grow. 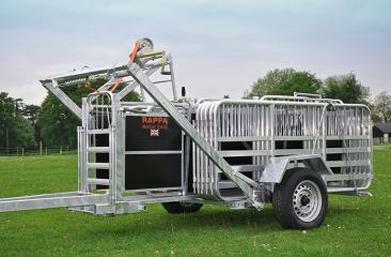 All of the gates and components are carried on the Yard base trailer which also forms part of the sheep race. Easy to deploy in the field, collect back in and move to the next location. All Rappa Mobile Yards are wholly made in our own factory, here in the UK. So you can be assured of timely and efficient back-up and after sales service from our experts in stock management. The 18” x 8’ race extension and Guillotine Gate make foot-bathing, ear tagging and drenching easy to do.